2 AM, the Wednesday after the EYC in Linz, Austria, my dad woke us up to leave for Rodellar, Spain. Alan and papa took their turns at the steering wheel, while I and Iris slept on the back seat. By 8 PM, papa called mama to tell her that we were already installed on Camping Mascún. Mama and Alan traded places the following week. 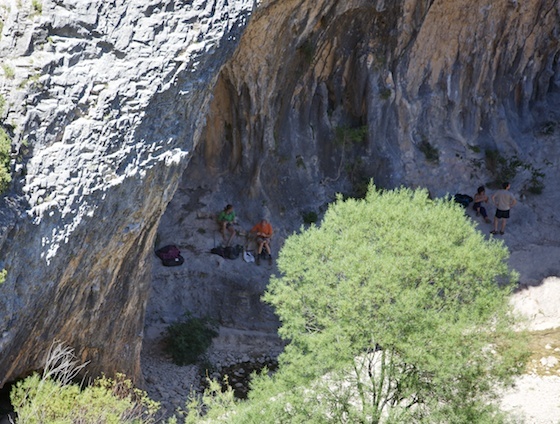 The first days in Mascun’s limestone canyon, I had to get used to rock climbing again. During the Easter holidays in Saint Léger du Ventoux, I also had to overcome my fear during the first climbing days. It was no different this time. I had to train à vue climbing, so I started with some 6th graded routes to overcome my fear, gradually increasing to 7th grade routes. After a few days, I started working in Coliseum again. Last summer we did not have enough time to finish this project. Alan made a funny film and went for some walks with Iris. The second day mama was there, I sent Coliseum. Alan had left to climb some mountain tops in Switzerland and he had taken his film camera with him. Mama was trying to film my ascent with papa’s photo camera, but she could not follow me on the display, shooting more rock and less of me. Therefore, I had to do it again for the film from another angle. After an hour’s rest I flew in it again. By that time Julie and Koen had arrived. 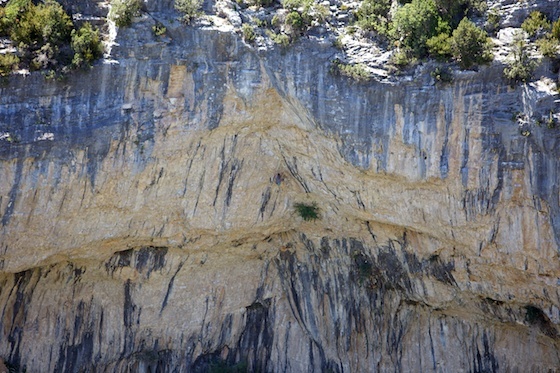 Later that day, he sent Fiesta pagana, an 8b in Gran Bóveda A. After working Coliseum out for two days halfway, and two times entirely – papa had to push me somewhat to get over my fear – I made my first attempt on the first day mama was there, but I fell right before the last hold. I wanted to do my crying in the rain, but there was only shade. I had enough of it for the day, so I went on training 7a and 7b routes à vue. The next day, I was fresh again and was able to send Coliseum twice. Having sent Coliseum in such a short time, I decided to put my teeth in another 8a. Since Mama liked the sector Aquest any sí, it had to be Rebelión en la granja. This is a 15 meter short, but powerful and technically complex route. 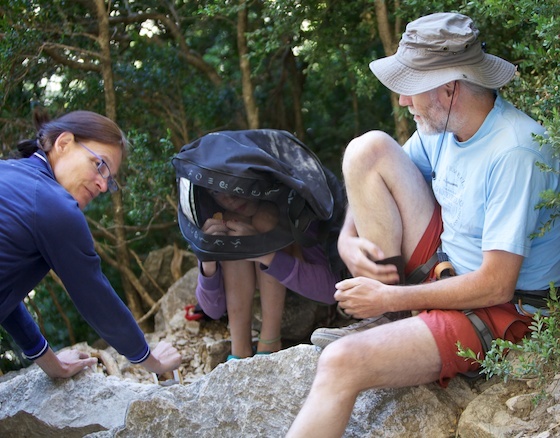 I could fairly quickly work it out entirely, but it took me a lot of attempts to finally send it and when I did, mama and Iris had set out for a walk to the Cresta del Balced. They had walked all the way up to the crest overlooking the camp site, crossing screes, over tracks lined with lavender into the fairy tale like seemingly soft rounded bright green bushes covered in sweet-smelling orange flowers. 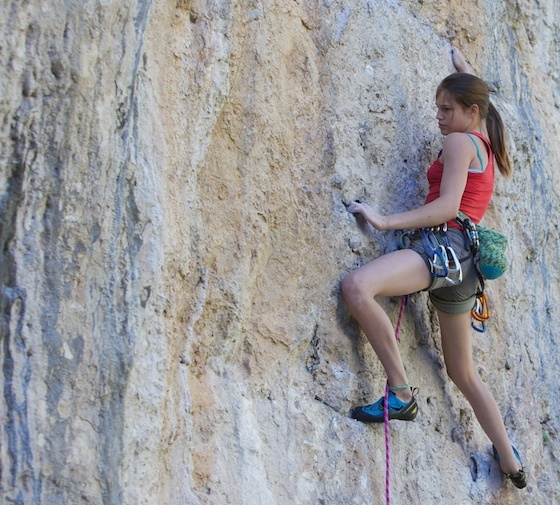 I was very happy to meet two American girls of my age, who also climb competitions and came to Rodellar to train on limestone while it is too hot for rock climbing now in their Colorado home country. Although Margot won bronze in the nationals this year and gold last year, she isn’t going to Singapore for the World Competition because she is a first year’s and it is too expensive, which is exactly the same case for me. Margot had already sent Rebelión en la granja, but Isobel was still working in it. Since I also wanted to give it a try, their trainer Garret replaced their quick-draws with mine. I hope to meet them again once at some competition.